Stefan Molyneux's take on the past weekend's bombings on the East Coast of the US. Thankfully, there were no fatalities from the bombings, so we're not looking for the Bloodbath Formula. Instead, transits for Saturday against the US Sibley Chart provide some relevant astro-poetry. Transiting Jupiter in Libra conjunct US MC: ideology held by "others" is forefront. Transiting Saturn in Sagittarius conjunct US Ascendant: struggle involving ideology. This forms a mundane square against the US chart with transiting Jupiter, suggesting ideological struggle yet again. 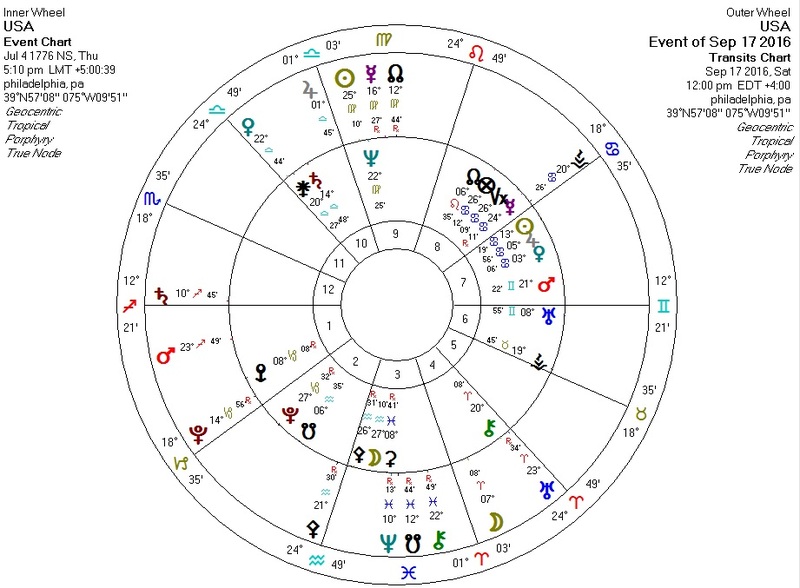 Transiting Pluto opposite US Sun and square US Saturn: explosive force against the country and its structures. Transiting Mars in Sagittarius square US Neptune: ideologically driven action affecting the nation's image and its illusions? Transiting Chiron and Uranus also aspect the US Neptune, suggesting perhaps the disillusionment process occurring now as the "establishment" view of geopolitics collapses. The US Seventh House Mars is also hit by these same transiting planets from different angles, hinting that US foreign policy is involved.